You will have a short piece of fiction to edit each week. The instructor will give individual feedback. 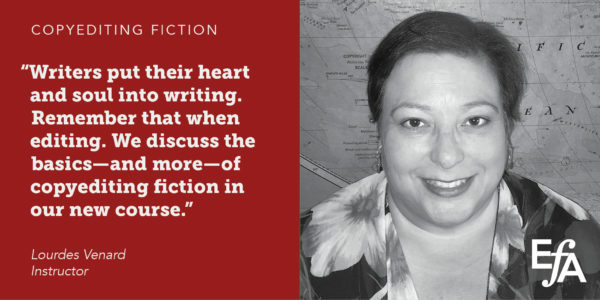 Instructor Lourdes Venard, owner of Comma Sense Editing, LLC, turned to fiction editing after 30 years of newspaper experience. She has edited hundreds of manuscripts, mostly crime fiction, science fiction/fantasy, and works with cultural/ethnic themes. She also teaches copyediting through an online certificate course at the University of California, San Diego. Our online courses are conducted through Sakai, a learning management system (LMS). You never need to be at your computer at any specific hour. More information about how these asynchronous classes are conducted is available here.